In an attempt to find a solution to clogged city roads and to provide an opportunity for growth in Germany’s high-tech industry, Volkswagen’s Audi and Airbus SE have signed a letter of intent with the German government to trial air taxis both in and around Audi’s home town of Ingolstadt. Flying car technology is very much on-topic today, while in March at the Geneva Motor Show Audi and Airbus demonstrated their mobility concept based on an ultralight, two-seater passenger cabin that is capable of being attached to a car or a drone. Additionally, Volocopter GmbH, a German startup backed by Intel Corp. and Daimler AG are aiming to offer the first commercial trips in the next three to five years with their drone-like electric helicopter which will be used to ferry people across city skies. In September last year in Dubai, Volocopter completed its first flying taxi test flight, obtaining an altitude of 200m and flying for over five minutes. It is anticipated the two-seater battery-powered helicopter will have a flight time of 30 minutes before requiring recharging. Additional competition comes in the form of Kitty Hawk, a company backed by Google co-founder Larry Page and Uber, which is working with partners on its own flying taxi strategy. Air Lease Corporation has signed long-term lease agreements with SAS for two new CFM LEAP-1A26-powered Airbus A320-200neo aircraft, scheduled for delivery in November 2019 and April 2020. Norwegian is continuing its Irish expansion with the launch of the carrier’s first route to Canada. Commencing 31st March 2019, the new daily service between Dublin and Hamilton – Toronto will mark the first direct flight between the two cities. Norwegian’s daily nonstop flights from Dublin to Hamilton – Toronto will be operated using brand new Boeing 737 MAX aircraft offering 189 seats in a high quality, modern single class cabin. Doric has officially established its presence in Asia Pacific with the opening of an office in Hong Kong, one of the world’s largest financial hubs. Doric is an investment manager focused on aircraft and real estate. Doric’s ethos is to balance ongoing cash flow distributions with long term capital preservation. Established in 2005, Doric has Assets under Management of US$9 billion. The team consists of 90 people from 20 nationalities in a worldwide network of offices in Germany, UK, USA and now, Hong Kong. The board of Israel Aerospace Industries (IAI), chaired by Harel Locker, has approved the recommendation of IAI's search committee and has named Brigadier General (Res.) Nimrod Sheffer, IAI’s VP of Strategy and R&D, as IAI’s new CEO. Sheffer will replace Mr. Joseph Weiss, who is stepping down after reaching the statutory retirement age. The nomination is now pending the approval of the State Companies Authority and the Defense and Finance ministers. Allegiant Travel Company has announced plans to establish a two-aircraft base at McGhee Tyson Airport in Knoxville, Tennessee. As part of Allegiant's growth plans in Tennessee, the company plans to create up to 66 new, high-wage jobs in the area. The Las Vegas-based company is investing more than US$50 million to establish its new base of operations, which will house two Airbus aircraft. The company, which focuses on linking travelers in small-to-medium cities to world-class leisure destinations, plans to begin its base operations at McGhee Tyson Airport in October 2018. Bombardier will reinforce its partnership with the Downsview Aerospace Innovation and Research Consortium (DAIR) to establish an aerospace hub in Toronto’s Downsview area. Through a multi-million dollar contribution, Bombardier will focus on three main goals: supporting DAIR’s academic and research activities, supporting DAIR’s operations, and preserving the aerospace heritage of the site. Starting this year, Bombardier will provide CA$1.5 million over five years to fund core research at the Aeromaterials Research Centre, to be established at the DAIR Innovation Centre. The Centre will bring together industry and academic partners in a collaborative space for aerospace training and education, R&D, and sector advisory services to maintain Canada’s leadership role in the global market. Starting in 2019, Bombardier will contribute an aggregate CA$1 million over five years for the creation of two Aerospace Research Centres at Ryerson University and the University of Toronto. These Centers will focus on research in the areas of advanced interiors and acoustics. In addition, Bombardier will provide funding to Centennial College for the completion of its Landing Gear Research project, while extending its existing training program to train a minimum of 50 individuals for each of the next three years at Centennial College’s Downsview Campus. Bombardier will also provide CA$900,000 over the next three years to support formal operations of the DAIR Innovation Centre, and as a founding member of the Consortium, will remain actively engaged by appointing a member to its Board of Directors. Finally, in recognition of Downsview’s historical importance in the development of the aerospace industry in Ontario, Bombardier will be providing a total of CA$2.5 million in capital funding to refurbish the heritage “Moth Building”, which will be the cornerstone of the DAIR Innovation Centre. AJW Group has announced that it is investing in the expansion of its AOG service. 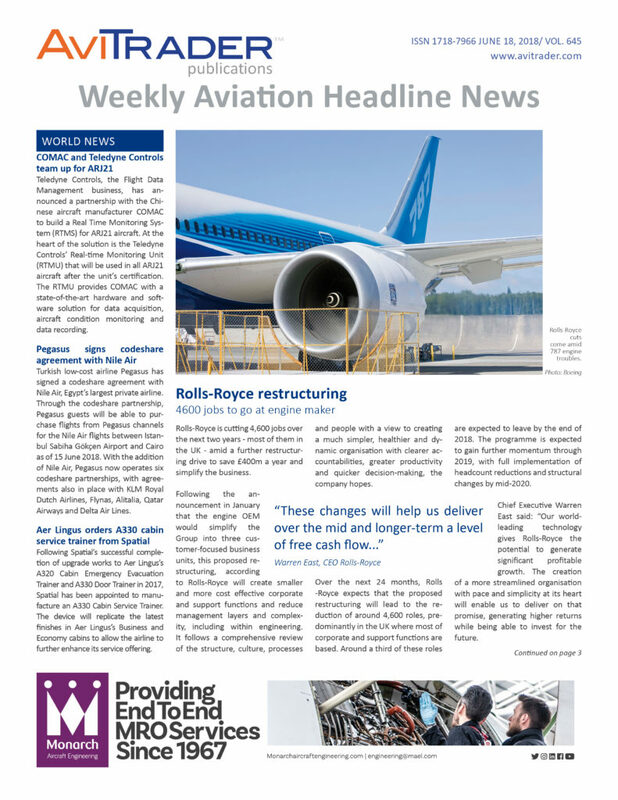 AJW’s decision to expand its AOG team follows extensive consultation with its airline customers. The increased capacity will ensure faster response times to delivering the right part to the right place to minimise the disruption and impact of aircraft on the ground. Christopher Whiteside, President and CEO of AJW Group, commented: “AOG incidents are hugely disruptive and costly to airlines and efficient handling can not only save them money, but support a positive experience for their customers which helps protect their brand. Airbus Helicopters has delivered the first two of a total of six H145 helicopters to Swiss Air-Rescue Rega. These will replace Rega’s existing fleet of EC145 helicopters, which will be phased out by mid-2019. The first H145 helicopter is expected to be deployed at the Bern base in October. Over a period of 15 years, the six EC145s have proven themselves to be reliable and versatile rescue helicopters, providing airborne medical assistance to around 60,000 patients to date. Thanks in part to these positive experiences, Rega is now opting for the H145, the successor to the EC145. “The H145 represents a continuation of our success story and ensures that we can continue to provide our patients with reliable and professional help in the years to come,” said Ernst Kohler, CEO of Rega. The second brand new Airbus A330 from Hi Fly's direct order has successfully completed its first flight in Toulouse on June 21, on time for an expected delivery in late July. The flight program included testing the aircraft for stability and controllability and checking the efficiency of the on-board equipment in all extreme configurations. The aircraft has now successfully completed the PATM (Production Aircraft Test Manual) - the basis for the Certificate of Airworthiness and is now ready and technically certified to fly the globe. The first two new Airbus A330 are currently completing the last phases of preparations and the first of them will soon be delivered to Hi Fly, while the second one is expected to be delivered next month.